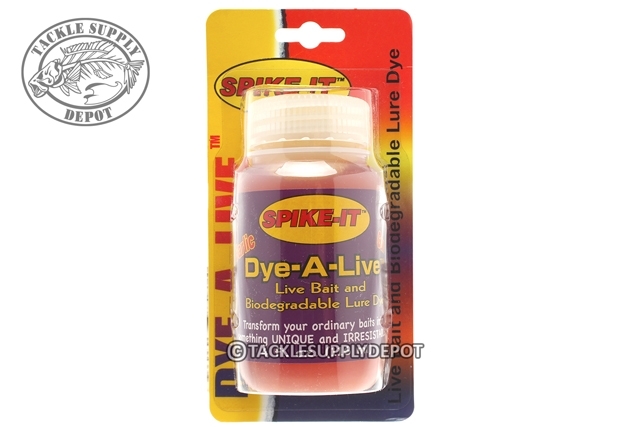 Dye-A-Live can ONLY be used on LIVE and BIODEGRADABLE baits. It does not work on soft plastics. Like the popular Dip-N-Glo for soft plastic lures, Dye-A-Live is a non-toxic formula made especially for biodegradable lures and live bait including baitfish, cut bait, shrimp, and worms. Dye-A-Live now makes it possible to enhance live bait and biodegradable lures by instantly changing the color of your bait to really catch the fish's attention! | 4 fl. oz.